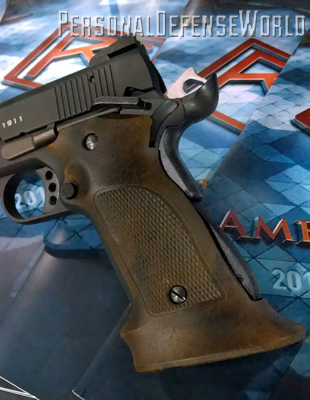 From concealed-carry designs to Desert Eagle stopping power, the 40th annual NASGW premiered new handguns for every type of shooter. 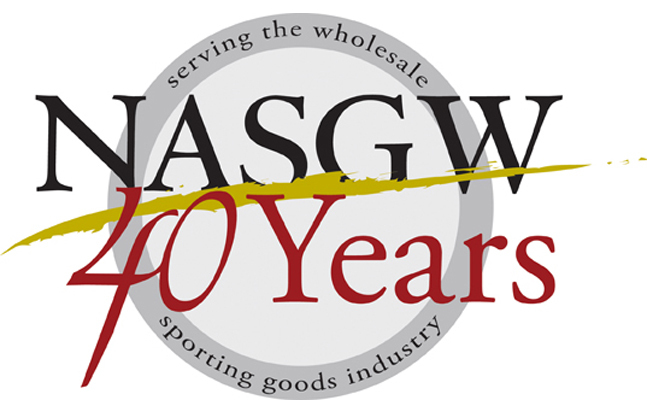 The National Association of Sporting Goods Wholesalers (NASGW) is a yearly preview of many new items that will be introduced by arms-makers the world over. 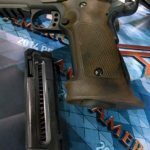 Open to wholesalers throughout the sporting goods industry, the show provides a first look at everything from new camping gear, sportswear, shooting and hunting supplies to the latest in handguns, rifles and shotguns for hunting, sport shooting and law enforcement. 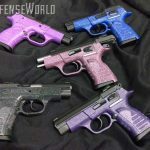 This year we have selected some of the very best to preview what’s new in handguns, rifles and shotguns for 2014, and they range from the most modest personal-defense pistols to high-tech tactical shotguns, multi-purpose survival weapons and some very flashy handguns designed specifically for women. 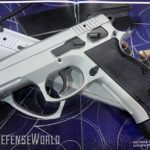 Handguns was by far the largest firearms category at NASGW, with manufacturers not only rolling out new models, but some interesting revisions and upgrades to existing semi-auto pistols. 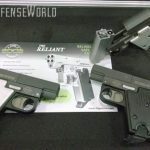 While new technology has been established with polymer and titanium frames for revolvers, the next step for semi-auto and tactical pistols (like the DoubleTap over/under) is developing new ways to incorporate these technologies to build better, more durable and more affordable self-defense sidearms. 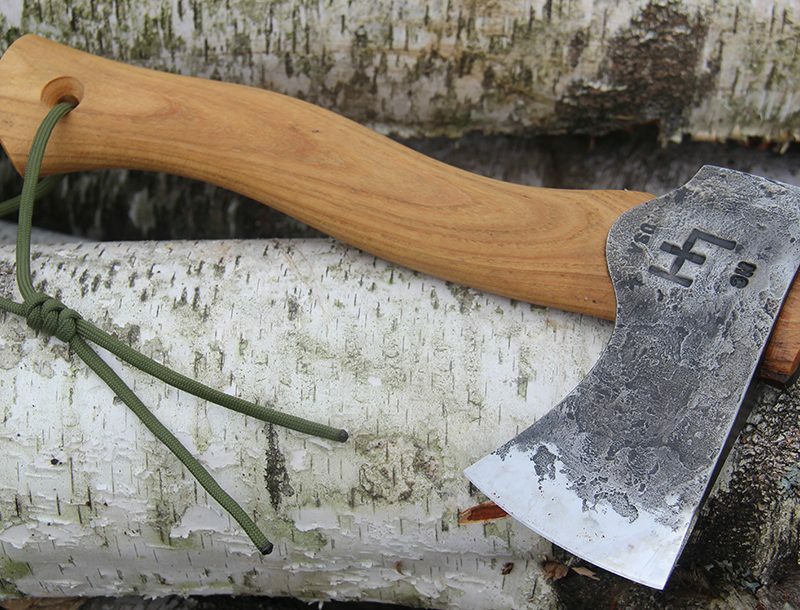 Following are some of the newest and most innovative approaches coming in 2014. 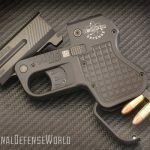 The latest versions of the DoubleTap over/under tactical pistol will also have optional .40 S&W and .45 Colt/.410-gauge barrels. 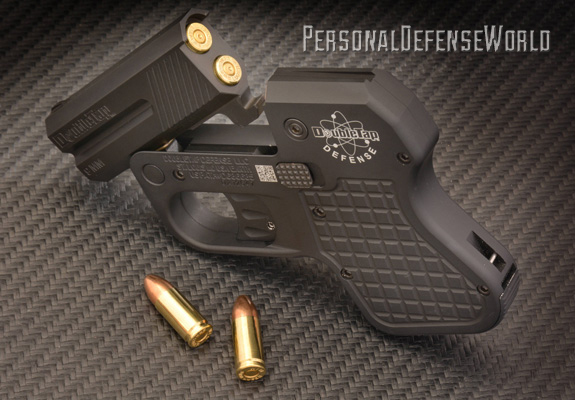 The titanium-framed, double-barreled pocket pistol weighs 15 ounces, measures 5.5 inches in overall length and 3.9 inches in height. 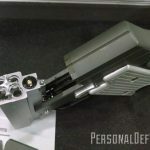 The interchangeable barrels are attached to the frame by a single hinge pin similar to those used to mount the upper receiver on an AR-15 and locked in place by a lug integral with the barrels. For loading or reloading, an ambidextrous thumb latch on the side of the gun is pulled to the rear, causing the barrels to automatically tilt upward due to an internal stainless steel spring. 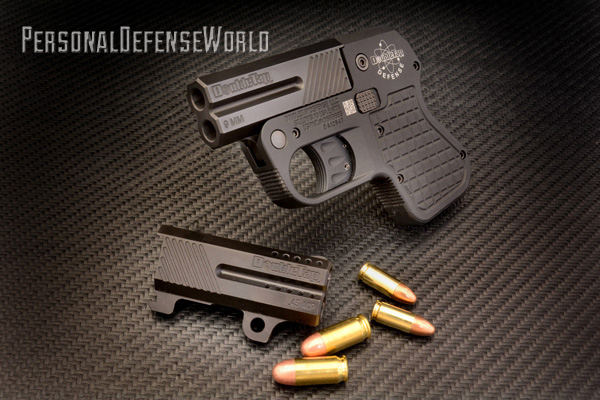 What makes the DoubleTap ideal for concealed carry is its enclosed action. 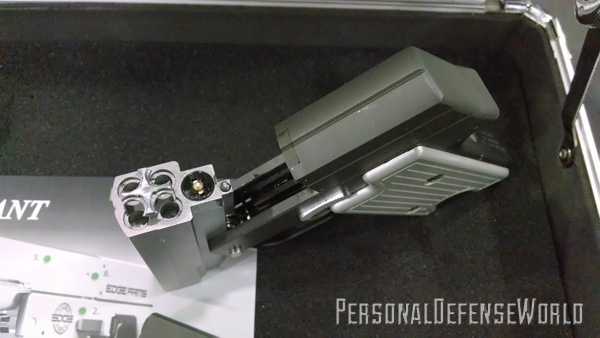 Except for the trigger and thumb latch, all other moving parts are permanently sealed inside the fire-control grip housing. 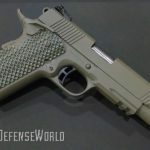 There is virtually no maintenance outside of cleaning the barrels, recoil shield and wiping down the exterior after firing. 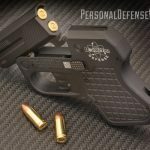 The lower third of the grip is a storage compartment with a hinged cover where two additional rounds on a speed strip can be kept for quick reloading. Externally, it is tough as nails with a hardcoat anodized matte black finish. Prices start at $499. For more information visit doubletapdefense.com. 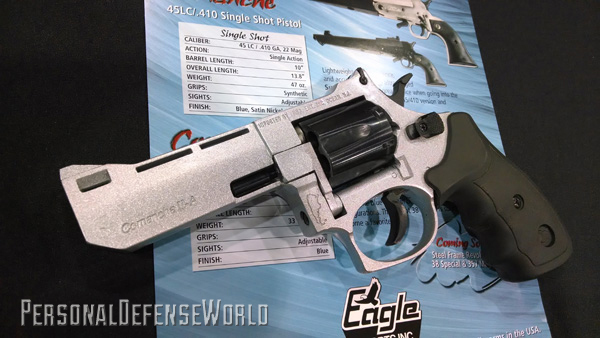 This is an entry-level .38 Special manufactured for Eagle Imports in Argentina. 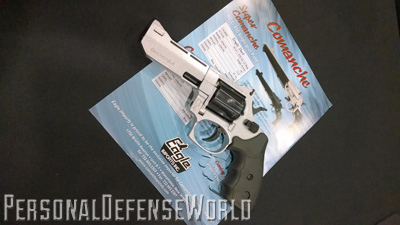 It is a revised version of the earlier Comanche .38 Special redesigned for 2014. 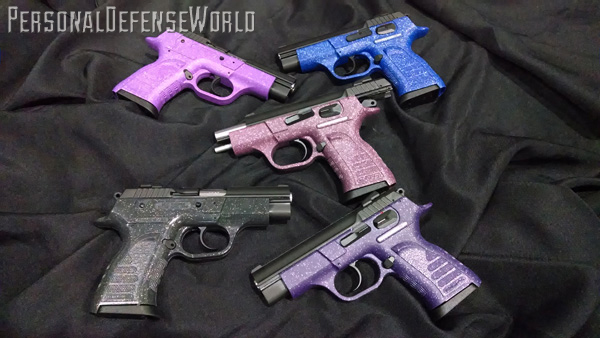 The new models are available with either a 3-inch barrel or a 4-inch barrel, and in two finishes, blued or duo-tone. The duo-tone finish features a metal-flake nickel finish on the alloy frame and steel barrel that’s contrasted by a blued cylinder. 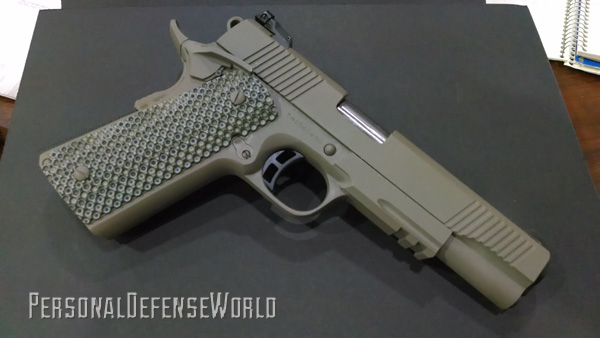 Grips are recoil-absorbing rubber in a combat configuration. The frame has an integral adjustable rear sight and the barrel an integral ramp front over a vent rib. 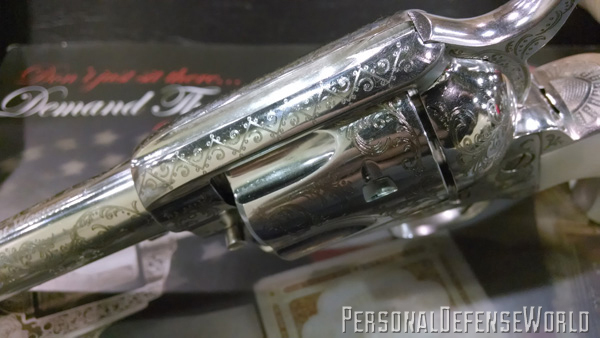 The six-round revolver is chambered for .38 Special only and not rated for +P ammo. Carry weight (empty) is 33 ounces for the 3-inch model and 35 ounces for the 4-inch model. With a suggested retail of only $225, the new Comanche IIA will be available in the first quarter of 2014 from Eagle Imports. For more information, visit bersa.com. 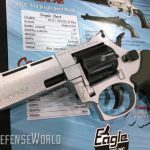 Still in the final developmental stages, the forthcoming Edge Firearms Reliant is a four-barrel Derringer built in the style of a subcompact semi-auto—only the Reliant has a four-chamber, tip-up barrel, DAO trigger with rotary firing pin and can be chambered in .22 WMR (.22 Magnum), .17 HMR or .380 ACP. 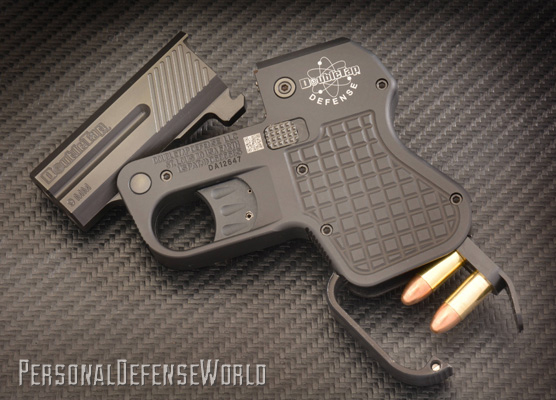 The striker-fired pistol uses an internal rotating firing pin that is blocked from contacting the cartridge primers until the DAO trigger is pulled, at which point an internal hammer is pushed back and the striker is rotated into alignment with one of the four cartridges. When the trigger reaches full rearward movement (about 8 pounds of effort), it causes the striker to drive the firing pin forward and discharge the gun. After firing, the striker and trigger mechanism return to a safe position with the firing pin again blocked from contacting the cartridges. The finger extension at the bottom of the grip frame is actually part of an internal cartridge holder (speed strip) that can be easily removed to reload all four chambers. 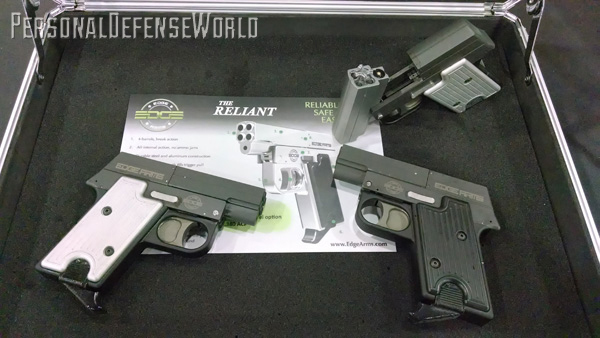 Using steel and aluminum construction, the Reliant will also be offered with an internal, trigger-activated laser. 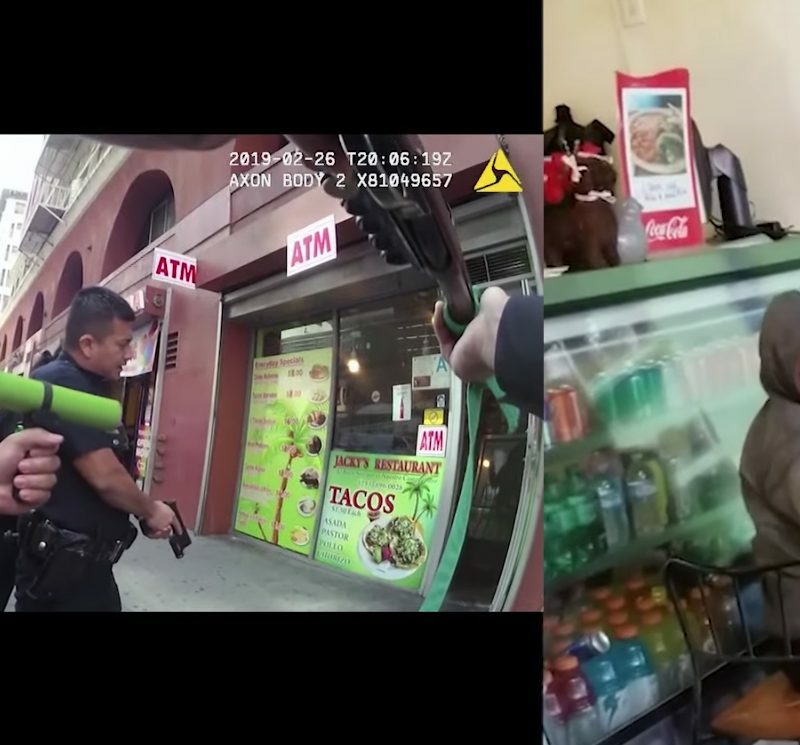 Because there are no reciprocating external parts, the gun can actually be fired from inside a pocket if necessary. There will be several versions of the Reliant available early in 2014. 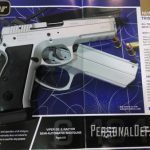 For more information, visit edgearms.com. The entire line is cosmetically designed for women by a woman and presented with a woman’s touch by EAA’s Sharon Lacy. The new 9mm Witness Pavona Polymer models are compact, easy to load, easy to control and easy to use. 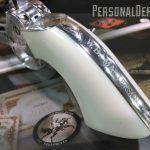 From its inception in the world-famous Italian “Valley of the Guns,” the Witness Pavona offers a lightweight, ergonomic grip in a distinct, compact, smooth, sparkling (metal flake) polymer frame with integral checkering and sculptured, contoured lines. 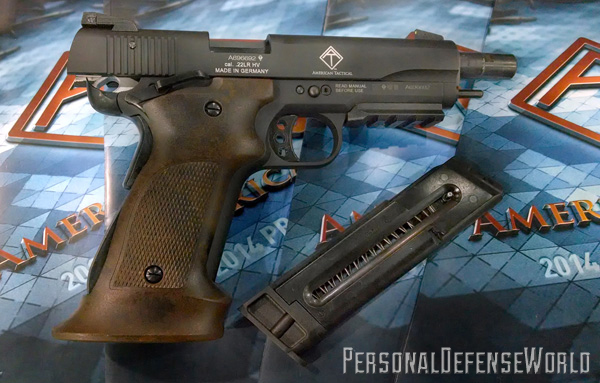 Tanfoglio kept the traditional external hammer, so when the hammer is cocked with the safety engaged before slide movement, the hammer spring is depressed, thus allowing the slide to move easier during loading. 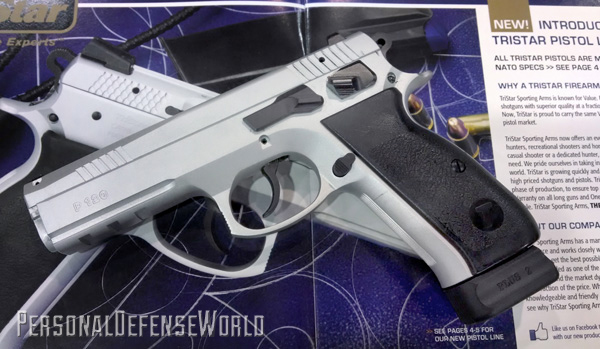 Tanfoglio engineers also fine-tuned the hammer and recoil springs to allow for smoother function in addition to adding unique slide-gripping areas to enhance the overall pistol function, feel and ease of use. 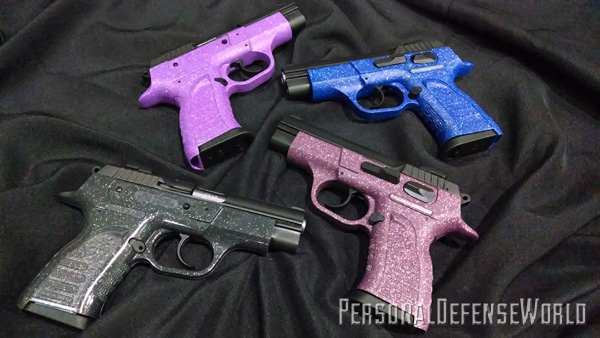 The new models are beautifully designed, elegantly packaged and have both unique color options and a sparkle for the woman that desires everything. For more information, visit eaacorp.com. 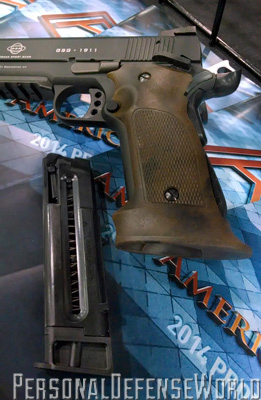 In order to spare you all the details of the breakup between Heizer Defense and the DoubleTap over/under pistol (now produced by DoubleTap Defense), Heizer had taken the road less traveled for 2014 and developed a single-shot .410-gauge shotgun pistol based on the design principals of the original DoubleTap, including the roller-bearing trigger design. 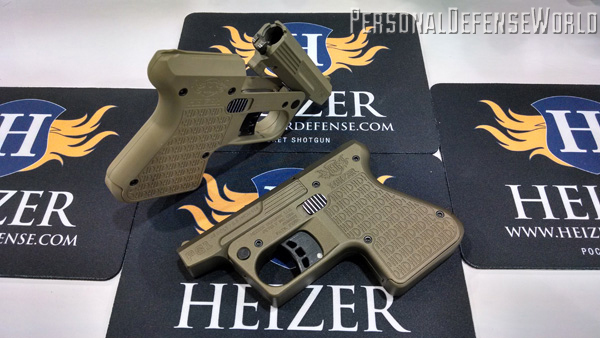 The Heizer, however, is a completely different end product with a longer single barrel that can chamber a .45 Colt defensive round or (as intended) a 000 buckshot .410-gauge shotshell. 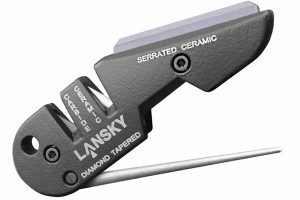 The design uses a quick-release lever to open the action and tilt the barrel up; an internal extractor raises the spent shell for quick reload. Additional space is provided inside the grip to store two additional rounds. 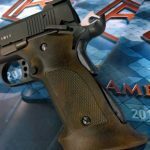 These titanium-frame guns will be available in desert tan, black, brown, pink and polished stainless steel with a suggested retail of $499. For more information, visit heizerdefense.com. 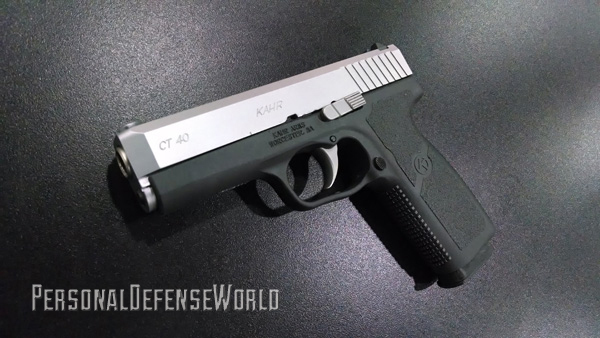 For 2014, Kahr will have more affordable versions of its largest 9mm, .40 S&W and .45 ACP models with the new CT9, CT40 and CT45 series. 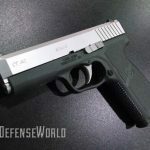 The CT is the largest pistol Kahr Arms produces and incorporates all of the same features offered on Kahr’s premium line of guns, including a single-stack magazine, Karh’s superb contoured-grip design with integrated side panel, front and backstrap checkering, patented Kahr “safe cam action” DAO (double-action-only) trigger system, a steel subframe within the polymer frame, a stainless steel slide and two-dot sights, but at a price that averages several hundred dollars less than Kahr’s premium models. 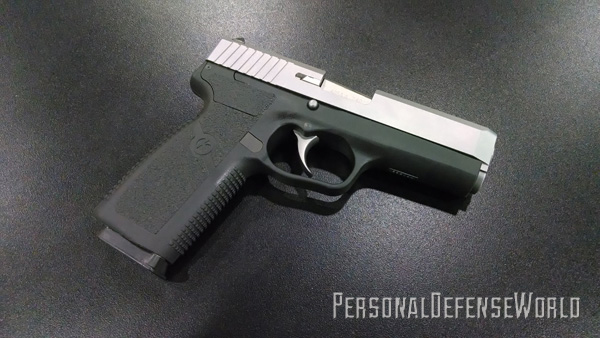 What Kahr takes away from the CT line is more related to aesthetics than function, with a simpler slide contour and barrels with standard rifling as opposed to the premium polygonal rifling used in Kahr’s TP series. All CT models feature a matte stainless finish on the slide and black polymer frames. 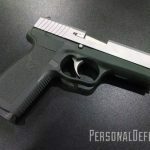 For more information, visit kahr.com. 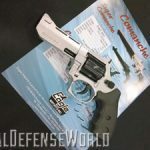 When it comes to historic SA revolvers, the designs of the past have found unending popularity in the high-tech 21st century because there is still nothing quite as nice in the hand as a traditional Colt Peacemaker. 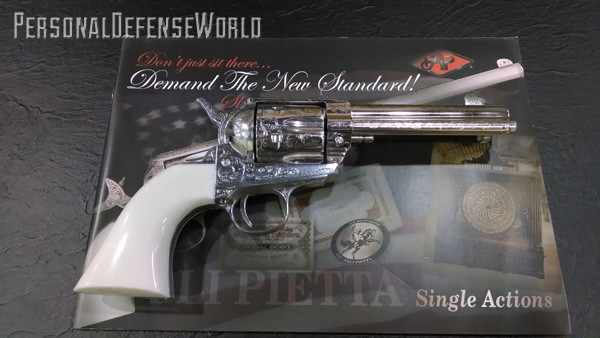 Today, Colt is one of many manufacturers who produce the legendary Old West six-shooters, and Pietta in Italy is among the best. 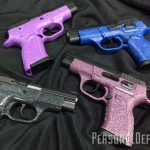 The company’s SA models have tuned actions and offer blued or color casehardened frames along with polished stainless steel or nickel finishes. 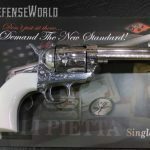 Most recently, Pietta has begun offering limited-edition, hand-engraved models that rival the prices for custom Colts. 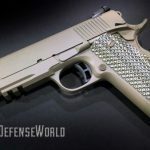 But, in 2014, the arms-maker will also offer its new deep-laser-engraved models at a fraction of the cost. These models will average around $800 in price and feature deep laser engraving that has the look and depth of hand engraving. The Bat Masterson is the newest entry. 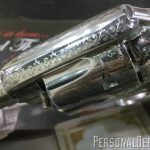 The revolver is based on one of the most famous guns ordered from Colt and replicates the model carried by the legendary frontier lawman and newspaper columnist in the late 1800s. 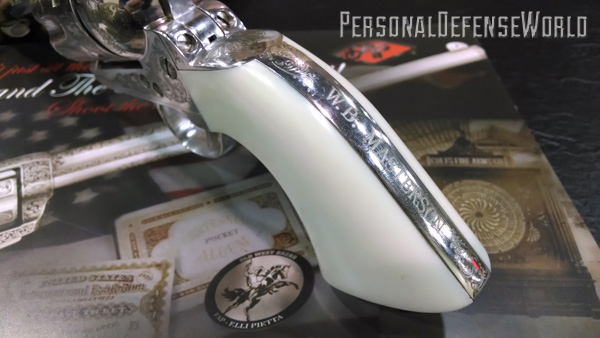 The original engraving was copied by the renowned Italian engraving firm Dassa and produced in deep laser with exacting detail to the special designs known only to the Bat Masterson Colt, including the W.B. Masterson name on the backstrap. For more information, visit pietta.it. And be sure to read the Fall 2013 issue of Guns of the Old West for a detailed review of all the Pietta and Dassa-engraved Single Actions. 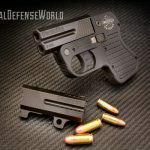 New from Taylor’s & Company, known for their fine Western handguns and long arms, is a modern .45 ACP tactical pistol with custom features. The guns are manufactured in the Philippines by Armsport. 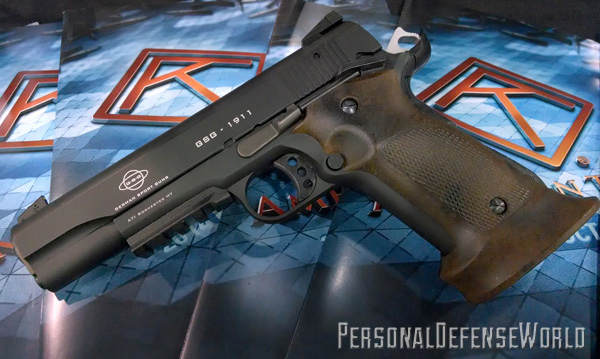 The Taylor’s Tactical 1911 models come with two 8-round magazines, a carrying case and a lifetime warranty. The full-size Government models have a Picatinny rail on the dustcover, custom G10 grips, ambidextrous thumb safety, dovetailed front and rear sights, skeletonized hammer and trigger, extended beavertail and special desert tan/Flat Dark Earth combination coloring. The Taylor’s models are also offered in gunmetal gray, black and a two-tone hybrid featuring a green frame with black slide. 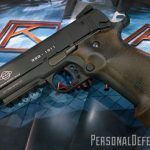 For more information, visit taylorsfirearms.com. 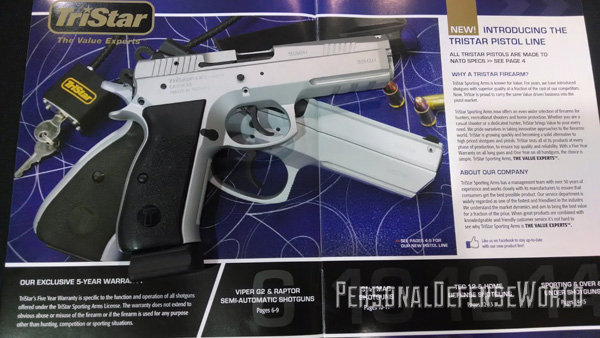 New for 2014 is the TriStar P-120 chambered in 9mm. 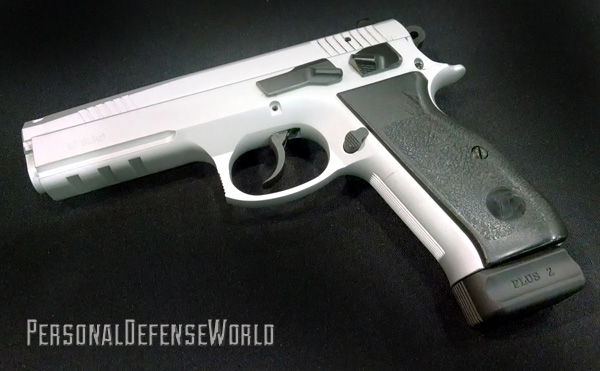 This is a full-size tactical pistol with a 4.7-inch barrel. 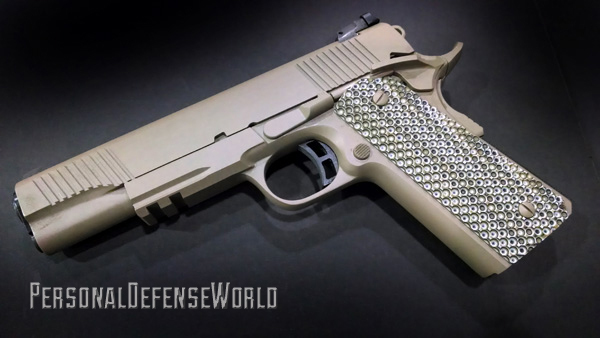 It comes standard with two 17-round Mec-Gar magazines, dovetailed white-dot rear sight and hard plastic grips. 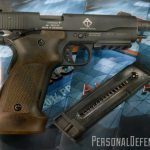 The SA/DA design is based on the CZ 75 SP-01, a model known for its ease of use and accuracy. Featuring an integral 1913 accessory rail on the dustcover, the SP-01 utilizes an extended beavertail to protect the shooter’s strong-hand as well as allowing for a deeper and more secure grip. The new grip geometry, checkering in key areas on the front and backstraps and redistribution of mass provided by the accessory rail noticeably decrease the perceived recoil from previous models and allows for more rapid target acquisition and transition. The TriStar version also comes with a carrying case and cleaning kit standard. The guns are available blued or in chrome. 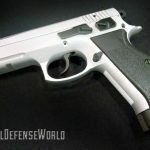 For more information, visit tristararms.com.